According to E! News, attendees such as TV personality Lala Anthony and tennis star Serena Williams were treated to delicious Shake Shack cheeseburgers, and all guests were given flower crowns to wear at the "all white" themed event held at a private Los Angeles home. After pigging out on their burgers the fun continued for hours while DJ Nabs provided music for people grooving on the dance floor. 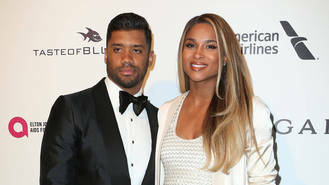 Ciara married the Seattle Seahawks player last July (16) after dating for just over a year. The couple announced they were expecting on 25 October (16), the singer's birthday. "Blue is one of my favorite colors..." Ciara noted on social media in February (17). The Grammy-winner is already a mother to two-year-old son Future Zahir, who she welcomed with rapper Future in 2014. The pair were engaged in 2013 but ended their relationship the following year (14).